Do you do a lot of camping or hiking? Do you like to rough it in the wilderness on survival adventures? Are you always looking for the best gadgets and devices to help you improve your gear? If so, then you need the best survival fire starter on the market in your pack today! In this article, you’ll learn about the best fire starter options available, and you’ll discover pros and cons for each one. You’ll be able to compare and contrast them to help you choose the one that’s perfect for your needs. Never again will you have to wonder how you’ll be able to start a fire on a hiking trip. Read on to learn more! 2 What is a Survival Fire Starter? 3 Why do You Need a Survival Fire Starter? What is a Survival Fire Starter? Basically, a survival fire starter is just what it sounds like: an item that helps you start a fire in a survival situation. This may work in one of a handful of ways. As long as the item is designed to help you get a fire started even in extreme circumstances, it fits the description. Ferrocerium rods – You’ve probably heard these referred to as flint. These rods are designed to create sparks when struck with a blade or serrated piece of steel. They are not dangerous otherwise. Magnesium blocks – These blocks can be shaved to create small piles of magnesium that will catch fire quickly when hit with a shower of sparks. Most of these fire starters also come with flint or some other method of causing sparks. Waterproof matches – You shouldn’t rely solely on these, but they can be a great alternative or backup source of heat. Fuel tablets – You can sometimes use these along with magnesium and flint to get a fire started even in the rain. Why do You Need a Survival Fire Starter? For survival experiences – If you like to camp and hike in a survival setting, these fire starters are very valuable. You might have a lot of trouble getting a source of heat without them. This can, in turn, cause you to get dangerously cold or have no means of boiling water for safety. For vehicle safety – If you should get stranded in your vehicle during a snow or ice storm, a fire starter can help keep you from freezing. Keep one in your car at all times just in case. For disaster kits – In the event that a natural disaster takes place, you may be very cold or have no access to fresh water. A fire starter in your disaster kit can help you with both of these potential problems and give you a lot of peace of mind. If you’re wondering how to use magnesium fire starter blocks, don’t worry! Most people don’t know how to use them automatically, and it takes a little time to get used to the method. Follow the steps listed below and you’ll be starting fires perfectly in no time. First, find some items you can use to start your fire. Cotton balls are a good option, but paper, twigs, leaves, and grass will work too. Use a knife or an included serrated shaver to cut shavings of magnesium from the block. Do this at an angle for best results. Put the shavings on top of your tinder pile. Hold the fire starter at an angle over the magnesium and slide a knife or scraper down the length of it to make sparks. Keep this up until the sparks ignite the magnesium and tinder. Take care to keep the fire burning by not letting the wind or rain put it out. In this section, you’ll learn about the best fire starters on the market today. You’ll be able to choose between a few different styles and plenty of different price ranges to help you find just what you’re looking for. This little set includes some of the best survival gear you could ask for, such as a whistle, a compass, and a durable magnesium stick and striker to help you get a fire started under any conditions. Use it time and time again without worrying about it wearing out. This starter includes a long rod for easy use. 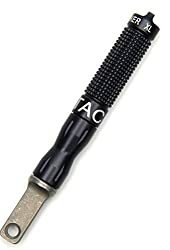 Features an ergonomic handle designed for easy gripping. May be harder to use than some of the other products listed here. Included compass has been known to arrive broken. This easy-to-use fire starter comes with everything you need to get sparks going quickly, easily, and as many times as you need. It won’t wear out quickly, and best of all, you can purchase it with a water filter for maximum survival use. Durable and watertight fire starter won’t get damaged in your backpack, even during a long hike. Comes with a guide to help you learn how to use the starter even if you never have before. May be difficult to light the first time without a little extra effort. Included lanyard may be too short for some people to use the starter properly. Start a fire easily with this magnesium fire starter block and included serrated striker. 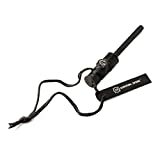 This pocket-sized fire starter comes with everything you need to get a reliable source of heat going even in the rain. Works well on any type of tinder you have available. Creates a large shower of sparks every time. May be very difficult to light, especially the first time. May require the use of a knife to get a fire started. Choose this incredibly durable product if you’re looking emergency fire starters that are sure to last. This starter comes with an additional emergency whistle to keep you safe during unwelcome situations. Built to last and very durable for all your outdoor adventures. Throws tons of sparks with every strike. May be difficult to light, especially the first time. Some individual starters have arrived chipped or damaged. For a simple fire starter that won’t wear out after a few uses, reach for these durable ferrocerium rods. They work easily and are great additions to any survival gear kit. 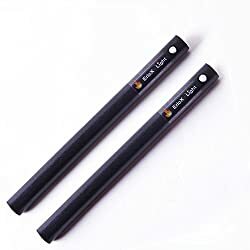 These rods are very large and heavy, perfect for lighting plenty of fires. Very easy to light and get a fire started with showers of sparks each time. May be too large and heavy for some packs. May not come with holes drilled in the rods for easy carrying. 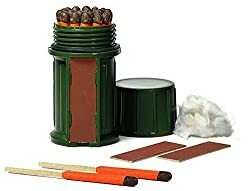 This handy little fire starter kit includes waterproof, windproof matches and three strikers to help you get started, all in one durable case that won’t take up too much space in your pack. Matches are very durable and will stay lit a while even when submerged in water. 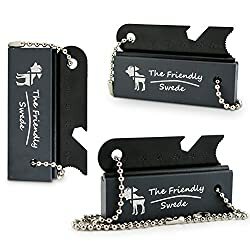 Works great on its own or with other fire starting products. Included case may be too large and bulky for some packs. Included striker may wear out faster than some others listed here. 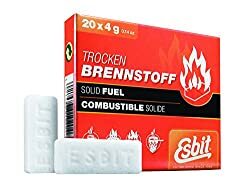 Use these solid fuel tablets to get a very hot fire going in a situation where you have a source of heat already present. You can use them along with another fire starter to have a readily available method to create fire even at a high altitude. You can keep these tablets in storage for years without damaging them or reducing their quality. Great for using with damp tinder that you’re having trouble lighting on its own. These tablets can be very easily blown out by a strong wind and will need to be shielded. While burning and afterwards, these tablets tend to have a strong smell that is unpleasant to some. Pick up these fire starter blocks to give you a great super hot strike every time you use them. Simply strike the starter against the attached block to get a fire going under any survival circumstances. Comes with three individually packed starters so you can easily have one ready for any situation. Starters include long chains so you don’t lose the pieces but still have plenty of room to work with. May take a very long time to shave off enough magnesium to get a fire started. Has been known to have trouble working if the magnesium gets wet. 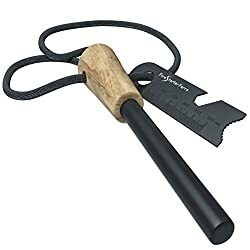 This simple fire starter for camping is built to last, with a durable wood handle and a replaceable inner rod that can give you thousands of strikes without wearing out. Designed with safety in mind, and comes packaged with a protective coating on the included rod. Produces very hot sparks that can be used to light a fire even in the rain. Since the rod is coated on arrival, it may take a few tries to get it started the first time. This fire starter is a little larger than some listed here, and may take up a bit more room. 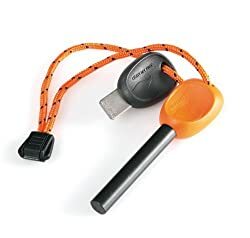 This portable all weather firestarter is designed to fit on your key ring for easy transportation and comes complete with a replaceable inner rod that will work no matter what the weather might be doing. Strikes up to three thousand times without fail. Easy to carry as it collapses in on itself. Might not be large enough for the needs of some survival campers. Included directions might be too difficult to understand for first-time users. When it comes to picking the best survival fire starter for your needs, you should keep in mind a few tips to help you choose. Check out our list below to help you determine the product that works best for you. How often do you go camping or hiking? Do you plan a lot of trips every year, or do you only go once a year? Will you need to be storing your fire starter for a long time in between uses? Most of the starters listed here can provide you tons of long-lasting fires over many years, but some of them may not last as long as others. Always check the shelf life of any starter you plan to purchase. Are you going to be using your fire starter for hiking, camping, and other outdoor survival activities? Or do you want something you can store for use in your vehicle or as part of your natural disaster kit at home? Camping will require a waterproof starter, but if you’re keeping yours at home, you might prefer to go a different route. The most popular type of fire starter is the magnesium block. With this starter, you can shave off some magnesium and use the striker to get sparks that set the shavings on fire. However, waterproof matches, fuel tablets, and ferrocerium rods all work just as well. It really depends on your preference. Most fire starters tend to run around the same price, but some can be upwards of $20 while others clock in at about $5. Remember that you might get a lower-quality starter if you don’t spend as much money on it. However, if you only plan to use it once or twice a year, you might be fine with this. Some starters come in a pack of two to help you save money in the long run. Now that you’ve seen the ten best fire starters on the market today, it’s time to make your decision! Will you go with a magnesium block and striker, or will you choose a ferrocerium rod? Will you supplement your gear with a fuel tablet or some waterproof matches? You have a lot to pick from, and depending on your specific needs, you might need a little more or a little less to work with. No matter what you choose, if you pick from this list, you’ll be prepared for any survival situation that comes your way. Get ready for the best camping and hiking experience you’ve ever had when you keep one of these fire starters in your pack! I use roadeavour flints. Its the best for me. Very reliable.